Cherie Nutting's East Village studio apartment opens to a narrow hallway. There is a modest darkroom on the left and, stepping straight, a small bathroom. "The plumbing is leaking again," she informs me. The bathroom walls are adorned with mementos—Cherie in a Davy Crockett cap, looking like Scout in the movie To Kill a Mockingbird, Cherie in ballerina tutu, Cherie's mother, standing in a white two-piece suit, the epitome of late-1950s glamour. There's a psychedelic painting of a knife and heart by Mohammed Mrabet, the Moroccan storyteller, and of course, pictures of Paul Bowles, which prove to be everywhere. Passing the niche kitchen, Cherie opens the refrigerator door. Inside, it looks like an igloo, with something snowed in that may be mayonnaise. I realize I should have brought some take-out with the bag of beer. Our shoes left at the door, we settle down on big Moroccan pillows. My only concern is the sweltering heat. "How is it a numbing sixteen degrees outside and blood temperature in here?" I ask. "You could open the window," she offers, "but the gates are broken. Just pretend you're in the desert!" It is the frantic week before Yesterday's Perfume goes to the printer. 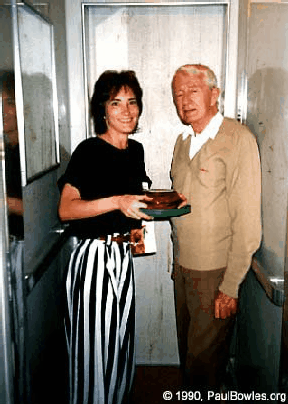 Cherie's book chronicles, in photographs and diaristic writing, the thirteen years she spent with Paul Bowles in Morocco. Having just returned from the office of her editor at Random House, Roy Finamore, she is contemplating the economic demands of the publishing industry and how her project resists standardization. Its 264 pages include contributions from Peter Beard and Bruce Weber and previously unpublished writings by Bowles. She is sorting paste-ups. It's a "This is going in, this is coming out, what do you think of this?" kind of conversation. I'm boggled, but form some idea of the overall picture. The great achievement of Yesterday's Perfume will be its presenting of Bowles, who died in November 1999, in a new light. Because Bowles chose to remain abroad in his modest Tangier apartment for almost fifty years, he is often perceived in the United States as standoffish and taciturn. Nutting presents Bowles as a warm and upbeat personality surrounded by a circle of talented friends. Call him the "last existentialist" if you must, as long as that assessment does not preclude having fun. STEPHEN AIKEN: You first visited Morocco as a child. CHERIE NUTTING: Yes. My mother and I sailed on the SS Constitution in 1960. Oddly enough, I was to learn that Jane Bowles would make the crossing on the same ship, one month later. We were on our way to Spain; however, our first port of call was Casablanca. At the captain's suggestion, we took a bus to Rabat. My mother was now accompanied by a German count, who was loving looking at her. She was tall and gorgeous. In the Casbah, all eyes were on my mother's blond hair. At the time I thought that Morocco was in the desert, but of course the Moroccan coast is far from the Sahara. So when the bus passed a spot that looked like the desert, I took a photograph of the landscape, which I later called "The False Desert." That was my first brief experience of Morocco, land of illusions. I always kept this little snapshot with me, thinking that one day I would return. SA: You went on to Spain? CN: For a few years we lived in Spain, mostly in Barcelona, where I attended the Marymount International School. I returned to Spain in 1970 and found it a very different place. Franco was still hanging on, but much of the unique flavor of the country had faded. These were the hippie days. I was traveling with my girlfriend, Stacey, and we decided to go south and take the ferry across the Strait of Gibraltar to Tangier. SA: Two young American women alone in the casbah. CN: Oh yes, the hustlers were all over us. Stacey wanted to leave the next day, but I convinced her to stay. We traveled south to Essaouira. One night we got high and Stacey began talking about wanting to get married and settle down. I was absolutely against this idea. I said, "No!" she should stay with me in Morocco. Well, we left for Marrakesh, and there at the American Express office, I met a guy named Meko, and we were married practically the next day. SA: American Express—I should say so! I thought we were on the Marrakesh Express. CN: Later we opened a store in Provincetown called Marrakesh Imports. 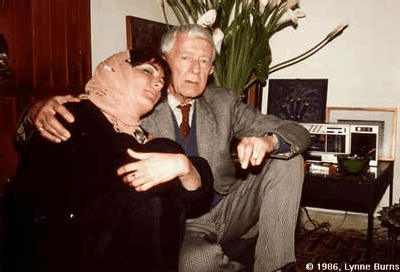 SA: When did you become aware of Paul Bowles? CN: Toward the end of our marriage, my ex-husband gave me a copy of The Sheltering Sky. "This book was written for you," he said, and he was right. It had an enormous impact on me. SA: And shortly after, you got the notion to write to Bowles? CN: Yes, I was having these dreams with strange images of birds swooping and smashing into my head. A short time after this, a good friend, Al DiLauro, died. It was such a shock. He was older than me, but so young at heart. I thought the dreams were a warning. SA: Al Dilauro, the artist from New York and Provincetown. He did that wonderful series of landscape collages, each with an artificial daffodil placed in the scene. CN: They had artificial daffodils at his funeral, and I saved two. He loved daffodils because they heralded spring and his return to Provincetown. SA: In this letter to Paul Bowles, did you write about the dream? CN: It was the story of my life—in about ten pages. I sent two photos with it. One was my masculine side, which I called "Scout"—I look like an Indian with a headdress. The other was of my feminine side, which I called "Alma"; in that photo I am sitting next to my altar in a negligee. I told Paul it was in my destiny that we should meet! SA: A ten-page letter from a stranger, and he wrote you back? CN: Yes. I never expected it. He even invited me to visit him in Tangier. SA: So you started packing? CN: Yeah, I went via Spain, stopping in Málaga to pay tribute to Jane Bowles. She is buried in the Cemetery San Miguel. In my hand I carried Al's artificial daffodil to place on her grave. I took away a film canister of earth and a bouquet of white plastic forget-me-nots as gifts for Paul. SA: In Tangier you had some difficulty locating Bowles' apartment. CN: Yes, Paul's directions were vague, and the taxi driver was of little help and left me in what looked like the middle of nowhere. I was lost, and it was starting to rain. Then I saw it—the 1966 golden Mustang that I had read about in Jay McInerey's article on Paul in Vanity Fair. SA: He did like to travel in style. CN: And never lightly, always ten or twelve valises. He liked to have lots of things to wear, I guess. SA: He wasn't exactly trying to blend in. CN: No, in the 1950s, he would arrive in little desert towns with his driver, Temsamany, who dressed in a cap and chauffeur's outfit. Paul owned a Jaguar then. SA: Back to your first meeting. I've read Bowles' description of his apartment in the Immeuble Itesa as being "visually neutral." CN: Well, it was visually dark—there were no lights in the hallways. When I found the bell and rang it, there was no sound. Just when I knocked, the door pulled open onto a chain-lock, and there was Paul peering out. I said, "I am Cherie Nutting," and the door slammed shut. He was just unlatching the chain—he did let me in. SA: Did you have your camera? CN: Of course, I flashed a picture the moment the door opened! His first vision of me was with a camera in front of my face. SA: Eventually you spent some time living in the same building. CN: Yes. I lived below him in Jane Bowles' old apartment. He was directly above me. It was nice. We could knock to say goodnight to each other. I would go bang, bang and he would go bang, bang, bang. SA: It sounds like the Count of Monte Cristo. What about his hypersensitivity to sound? CN: He had a very particular sleeping arrangement. He liked the head of his bed to face north. He wore a mask and earplugs and locked himself in his room. And then there was this machine he had constructed beside his bed. It was a fan precariously balanced with a coat hanger and a piece of string linked to a taifor, which is a low, wooden Moroccan table. SA: I like this, it's very Marcel Duchampian. Tell me more. CN: Once I touched it by mistake, and he almost had a heart attack, telling me it was all placed so that the sound was the exact same frequency as the dogs that howled all night in the street. If it moved even slightly, the frequency would change. SA: Bowles said he though of his childhood self as a "registering consciousness." He fantasized that there was an audience behind his eyes, much like in a theater. He constructed elaborate imaginary diaries in code and, a little later, practiced the surrealistic method of automatic writing. He seemed to be looking for a way to describe the world from outside of himself. CN: What you're talking about was very evident in his relationship with Mrabet. SA: Bowles translated Mrabet's tales from Darija Arabic, the unwritten language spoken in Morocco, and brought them to publication. CN: Mrabet and Bowles also had a language of their own invention. They conversed in symbols. Mrabet's everyday speech had an abstract quality. He spoke in parables. Paul loved Mrabet's concept of the world as a dual reality. Moroccans can be very direct, but more often they speak in a contradictory, circular fashion. Paul uses that funny quote in his book The Spider's House. "You tell me you are going to Fez. That means you are not going. But I happen to know that you are going to Fez. Why have you lied to me, you who are my friend?" CN: It was so much fun trying to decipher what those two were talking about. As an only child, I had my own secret club, so I knew a little bit about the business. I was president and sole member of the Golden Eagles. I had a cash box for the dues, but no one ever answered the roll call. I alone spoke the secret language. SA: On two memorable occasions, you introduced me to Bowles in Morocco. One thing I found very interesting was the way he responded to the words one spoke, not always to their implied meaning. At no one's real expense, he seemed to be able to reflect casual speech back, and get a good laugh out of the absurdities inherent in the language. CN: Yes, here is an example. He was angry with me for something, and Paul rarely tells you directly when he's angry. He is subtle, so one has to look and listen closely. He's very hard to read. Well, I walked into the room one day and came right out with it. "Paul, are are you mad at me?" "Mad?" he questioned, "Only dogs are mad, of course I'm not mad!" He was "angry," but we worked it out later. SA: Yesterday's Perfume is difficult to classify. How would you explain it? CN: Well, the first thing you have to understand is that the book is very personal and subjective. In this sense, it is not strictly about Paul Bowles. It's more of an autobiography of my relationship with Paul. With photography, with text, and other materials. I've recorded our responses to one another. It's a memoir of a time and a place, a time and a place that is already racing away from me. When I first met Paul, he was elderly but still seemed fairly young, and I was a young woman. Now I'm a middle-aged woman, and Paul is gone. Simply put, we went through some of life's changes together. SA: In one portrait from the book, we can see in Bowles' eyes twin images of you, the photographer, bent over your tripod, looking through the lens at us or, more appropriately, at Bowles. We are somehow sandwiched in an instant between you two. Possession and the transmutation of identities are relevant themes in Bowles' writing. How would describe your relationship with Bowles? CN: It was a love affair of the heart, and although we were physically very affectionate, it wasn't consummated in the sexual sense. Paul had been married and very devoted to his wife Jane. They were unique individuals in a special relationship. Paul, for one, hated to be labeled—gay, straight, or bisexual, there was no one quite like him. When Jane died, Paul said, "All the fun is over." Still, I think we had a little fun. SA: Let's talk a little more about The Sheltering Sky. As Bowles tells it he drew from his experience with the drug majoun in writing the death scene of his protagonist, Port Moresby. It is one of the most memorable scenes I have ever read. What exactly is majoun? CN: Majoun is made from the female cannabis plant. It's mixed into a paste with honey and dates and eaten. It can be quite strong. Port, in The Sheltering Sky, dies from typhoid. Paul had typhoid years earlier, and with the memory of that experience and the majoun, he worked out much of the death scene. But don't get the wrong idea, Paul wasn't much of a drug taker, nor was he a drinker. He smoked a bit of kif and that was all. SA: In the late 1980s, the celebrities were again turning up in Bowles' milieu. Bertolucci was in Tangier to film The Sheltering Sky, along with John Malkovich and Debra Winger. The Rolling Stones were back in town. It must have been very exciting. But the real star for me was your second husband, Bachir Attar. CN: I first met Bachir Attar in Paul's apartment. Bachir is the hereditary leader of the Master Musicians of Jajouka. Jajouka is an ancient music tradition with sources from pre-Islamic times. The Rolling Stones came to Morocco because of Bachir. They wanted to record a track with him for their album Steel Wheels. Bachir is a hero and a credit to his country, for he has saved his music and brought it to the Western world. SA: I still have the album—The Pipes of Pan—that Brian Jones recorded with Bachir's father. You could make a case for it being the first album of the world music genre. CN: That was made in 1969, and Brian Jones died shortly before the Rolling Stones released the record in 1970. (Brion Gysin died in 1986.) Bachir and I re-released it in 1995. 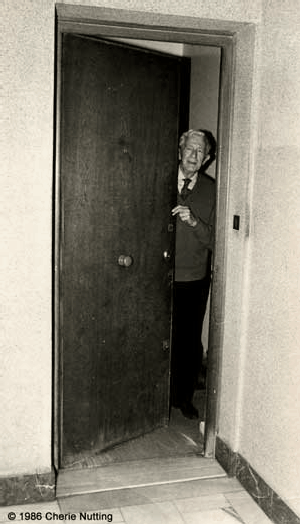 Paul Bowles had very little interest in rock music, yet Mick Jagger brought the BBC to his apartment to film an interview. 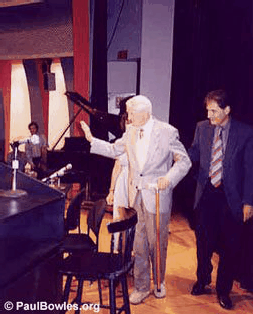 Paul Bowles during his last visit to New York in 1995, accompanied by Phillip Ramey, bids his audience good-bye at The New School for Social Research on September 20th. SA: Bowles made his last trip to the States in 1995. CN: For the Jonathan Sheffer performances of his music with the Eos Orchestra, in New York at Alice Tully Hall. SA: Yes, Bowles, the composer. There was an "Evening with Paul Bowles" at the New School for Social Research. He was interviewed by the composer Phillip Ramey. They were a perfect team. The audience was awestruck with Bowles' sharp wit. Ramey had all the right cues. They worked the room like George Burns and Gracie Allen. CN: That's what Paul loved about Phillip. Phillip was able to do that with people, draw them out. Paul could just sit and say nothing at times. He chose people like Phillip and Mrabet and me to create a commotion. He liked to be entertained by a scene, as long as he felt he wasn't involved. But of course he always was. SA: You last saw Paul in August 1999. CN: Yes, he was fading. His body was falling apart, his eyesight, his hearing, yet his brain was perfectly sharp. We said a just-in-case goodbye, but I really thought I'd see him for his birthday on the thirtieth of December. I guess he didn't want to have anything to do with the millennium. Paul's servant, who looked after him for many years, said, "The last thing he wanted to hear before he died was the sound of the cicadas." So the servant went out with a recorder and taped their music for him. STEPHEN AIKEN is an artist and writer and the director of the 234 Gallery Hannah in Wellfleet, Massachusetts, on Cape Cod. He and wife Susan Hannah previously ran Hannah boutiques on Prince Street in Soho in New York and in Siesta Key, Florida. Aiken's photographs and articles on contemporary art have appeared in Art News, Art New England and Provincetown Arts Magazine. Stephen Aiken contributed to the book Tanger Telegramm by Florian Vetsch—the first German anthology of Tangier. This article and interview originally appeared in the book Morocco: the Collected Traveler, edited by Barrie Kerper (New York: Three Rivers Press, 2001). Read a book review of Yesterday's Perfume: An Intimate Memoir of Paul Bowles by Jon Carlson.